Acknowledge your Learned Skills and your need to survive; utilize your abilities and create new ones. If you think you can, you’re right. ​ If you think you can’t, you’re right. It bears repeating that, until we learn to walk on water and pass through walls, some of the survival tools we have learned through life are helpful, and still many fall into the category of limiting and no-longer-useful. The mind is a wonderfully powerful thing. It has up to 80,000 thoughts per day, and all of these thoughts are creative. Unfortunately, 90 percent or more are repetitive and 60 to 80 percent are negative. 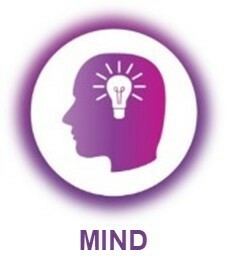 Our goal is to turn the mind into a fully utilized asset that is creating a life for us in a direction we want to go. Because we are creative beings, our attention is our treasure. Wherever we put our attention will grow. So, let us begin focusing on what we desire. Neuroscience research shows that, if we begin our self-work by trying to fix ourselves, our minds will retreat to survival mode. This engages the amygdala of the brain and sympathetic nervous system, often called our fight-or-flight mode. This part of us only knows old ways of reacting and being that are based on what we have experienced. It is not creative, and will win any battle over new ways of thinking. Therefore, our first exercise is to recognize all the incredible things our minds are doing well. There are most likely parts of our life where our experienced self and learned skills are aligned with our hearts’ desire to thrive. When we begin here we engage the prefrontal cortex of the brain and parasympathetic nervous system. This is the part of us that is most creative. It can support us most effectively in honoring our hearts’ desires and in uncovering ingenious and inspired ways of looking at challenges and trying new things. What are those little things I love about life that my day would be incomplete without? What are the things I love about my current life or things in the past? When in life did I feel most creative? When did I feel at my best; most successful, proud, joyful, connected, loved, or accepted? Our challenges, or weaknesses, are places where our lives are not aligned with who we desire to be and what is meaningful for us. It is important to acknowledge these. They represent the reality of how we see and feel about our current life. They bring our attention to what might not be working well. These items give us motivation to make change. Here are the questions to answer in your journal. What are the things I don’t like, or even hate, about my life and I want to change? What are the things I don’t like about life in general, or the world, and I want to change? The previous two exercises, about what is and is not working in life, may be easy for some minds to work with. However, some of us may have been conditioned to not praise ourselves. Others may have been conditioned to not change the way things are. In either case, when the mind does not feel emotionally safe it retreats to survival mode. Working with an experienced mentor or Intentional Journey Coach can be an effective practice for opening up the mind to recognizing what is working well and acknowledging what is ready to change. In this way we can have help in creating a safe and fully accepting environment to explore in. Now that you have four journal entries from the exercises in Key Practice #1 and #2, work with these to create an overall Visioning List. After you complete this, we will look at what is most important and possible to achieve. This is a two-step scoring process involving desires and beliefs. The reason we are doing this is to bring to the forefront what is most meaningful for us that our minds feel is safe and achievable. Step one is to score all the items on your Visioning List on a scale from 1 to 10 in terms of how much you desire or value them. Step two is to score all the items on your Visioning List on a scale from 1 to 10 in terms of how much you believe you can have them. As we begin this new journey in our life, we want to work on items that create new neuropathways of success. Then we can begin to teach our minds that we can be successful and it is safe to follow our hearts’ desires. Our minds can witness and support the joy of positive outcomes. As the mind learns to trust the heart, more items will rise in believability. Raj Raghunathan PHD. How Negative is Your "Mental Chatter"? (Psychology Today: Sussex Publishers, LLC, October 10, 2013), www.psychologytoday.com/blog/sapient-nature/201310/how-negative-is-your-mental-chatter. Richard E. Boyatzis, PHD and Kleio Akrivou, PHD. The Ideal Self as the Driver of Intentional Change. (Journal of Management Development: Emerald Publishing Limited, 1982), Vol. 25 Iss. 7, pp.624-642, http://www.emeraldinsight.com/doi/full/10.1108/02621710610678454. Boyatzis and Akrivou. The Ideal Self as the Driver of Intentional Change.